Published Tuesday, October 4, 2011 Al-Alkhbar English. The role of radical lawyers in anti-colonial struggles of the 20th century is obvious and well known. It should thus not be a surprise that revolutionary agitation in Syria was not the work of rebellious peasants and army veterans, but rather the work of intellectuals of a new and radical generation, raised under colonial rule after the end of the Ottoman state. Just as legal structures legitimated French mandate rule, the mandate’s most sophisticated critics used legal arguments to attack the hypocrisy and violence of France’s empire. Published Oct 19 2011 on Jadaliyya by Syrian film critic Hassan Abbas. The uprising embraced the principle of non- sectarianism and called for the preservation of national unity. However, the regime is using sectarian mobilization in a continuous attempt to create sectarian strife, to allow it to achieve the same goals that it is pursuing by divesting the protest movement of its peaceful character. 3-The number one citizen media network that sends news, videos and statements to all kinds of media worldwide is Local Coordination Committee. Number one news source on the Syrian revolution. 4- Short Syrian Film, an animated movie launched 6 days ago on the Syrian revolution. You can watch here. 5- Inside Homs, besieged center of Syrian resistance published on BBC by Sue Lloyd-Roberts who was in Homs few days ago. On Fridays the protests still take place after midday prayers, the demonstrators attempt to block off roads and, in a network of makeshift hospitals, doctors who would be arrested and tortured if they were caught treating protesters, prepare for the inevitable casualties. 6- On PULSE: “Thank You So Much” said the father of the murdered nine-year-old Ibrahim Shayban to Russia, China and Bashaar al-Asad. 7- On Islam in Europe Blog “Pro-regime Mufti threatens Europe with suicide attacks” if they launched military strikes against Syria. 8- Killing of opposition leader in Syria provokes Kurds [and Syrians in general] published on War in Context blog. 9- BlueCoat: US technology surveilling Syrian citizens online published on Global Voices Advocacy website. 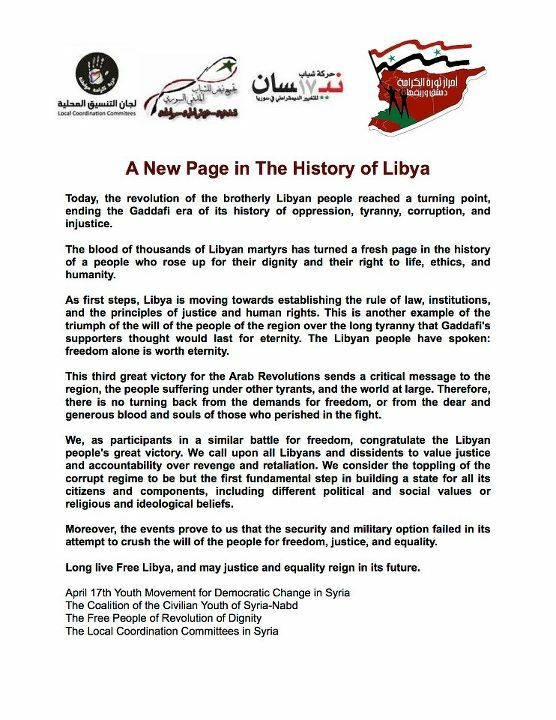 And finally, something from today’s Friday in Syria: 10 – Syrian protesters congratulate Libyans after Gadhafi’s death; up to 14 killed in crackdown.